Explore Chicago’s famously affluent North Shore in style on this private, half-day tour. After you’re picked up from your Chicago accommodation, you’ll be whisked away on this scenic sightseeing tour, passing by historic mansions, pretty gardens, and beautiful views overlooking Lake Michigan. See sights ranging from the Northwestern University campus in Evanston to the Chicago Botanic Garden before heading back to the Windy City and being dropped off directly at your hotel. This half-day outing from Chicago begins directly at your Windy City accommodation: your guide will pick you up in a comfortable, private vehicle at 9am, after which you’ll be on your way. Your destination is the North Shore: one of the most affluent areas of the country, it’s famous for its Lake Michigan views, its beauty, and its cultural pedigree. On this tour, you’ll get an up-close experience of the best that the North Shore has to offer. Visit lively downtown Evanston, where you’ll see Northwestern University’s campus, visit the home of former Vice President Charles Gates Dawes, and drop by the Shakespeare Garden. 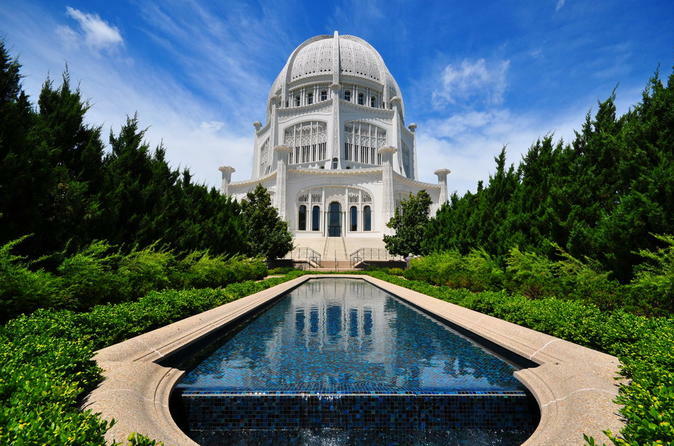 Then, head to the Baha’i House of Worship in Wilmette, the oldest surviving Baha’i House of Worship in the world, and the only one in the whole of the United States. The temple is also an architectural marvel, with its elaborate carvings and lovely gardens. On the half-day tour, you’ll also venture to the Chicago Botanic Garden, one of the city’s prettiest green spaces, where you’ll have time at your leisure to wander the tranquil grounds. A tram tour is included in your visit to the Botanic Garden. At the end of your stroll, you’ll reconvene with your driver, who will take you back to Chicago and return you directly to your accommodation.